Excerpt from Phantom International press release from May sent by Alex Udin/Phantom International. 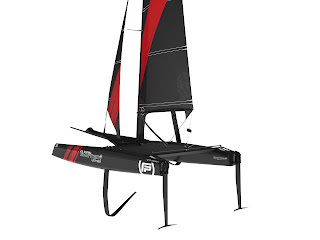 In short: Flying Phantom Ultimate & Flying Phantom Essentiel will use new designed hulls. Click images for orig size. Ultimate's new hulls are the ones presented some months ago. Also check below also their nice Windsurf foiling / Essentiel clip below by Wanaii Fims. Following various publications in the sailing media, Phantom International would like to clarify the situation. 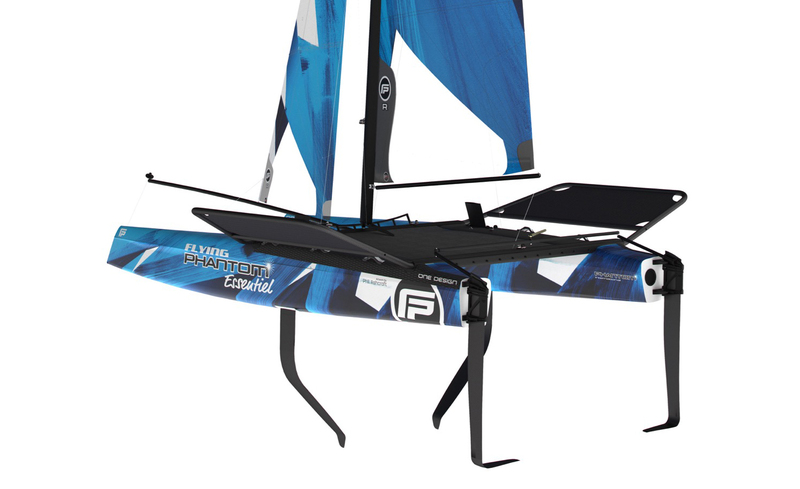 The Flying Phantom Essentiel and Ultimate are designed in collaboration with D3 Applied Technologies and are not concerned by any court issues. Phantom has the full ability to produce and deliver these boats. Next stop: Quiberon (France) this week-end for the FP Series and Extreme Sailing Series. The opportunity to test the FP Essentiel whilst watching the fantastic show that the FP Elite and GC32 will offer on the water. Then Phantom will be heading to Germany, Holland, Italy and Switzerland. It’s been an extraordinary event again this year with 1200 windsurfers gathered in Gruissan (southern France) for 4 days of competition. Phantom International showcased its windsurfing line and received a strong interest from the public and the professionals thanks to its technological approach and price philosophy. We have a new stock available, ready for delivery. Check out our website and order your gear asap. We have limited quantities. Phantom R&D and engineering team is currently working on a windsurfing foils line. These foils will feature the latest technology and materials available in the industry. We can’t wait to tell you more about it soon.